Materials science is a field that Jason Trelewicz has been interested in since he was a young child, when his father—an engineer—would bring him to work. In the materials lab at his father’s workplace, Trelewicz would use optical microscopes to zoom in on material surfaces, intrigued by all the distinct features he would see as light interacted with different samples. Now, Trelewicz—an assistant professor in the College of Engineering and Applied Sciences’ Department of Materials Science and Chemical Engineering with a joint appointment in the Institute for Advanced Computational Science at Stony Brook University and principal investigator of the Engineered Metallic Nanostructures Laboratory—takes advantage of the much higher magnifications of electron microscopes to see tiny nanostructures in fine detail and learn what happens when they are exposed to heat, radiation, and mechanical forces. In particular, Trelewicz is interested in nanostructured metal alloys (metals mixed with other elements) that incorporate nanometer-sized features into classical materials to enhance their performance. The information collected from electron microscopy studies helps him understand interactions between structural and chemical features at the nanoscale. This understanding can then be employed to tune the properties of materials for use in everything from aerospace and automotive components to consumer electronics and nuclear reactors. Since 2012, when he arrived at Stony Brook University, Trelewicz has been using the electron microscopes and the high-performance computing (HPC) cluster at the Center for Functional Nanomaterials (CFN)—a U.S. Department of Energy (DOE) Office of Science User Facility at Brookhaven National Laboratory—to perform his research. Nuclear fusion—the reaction in which atomic nuclei collide—could provide a nearly unlimited supply of safe, clean energy, like that naturally produced by the sun through fusing hydrogen nuclei into helium atoms. 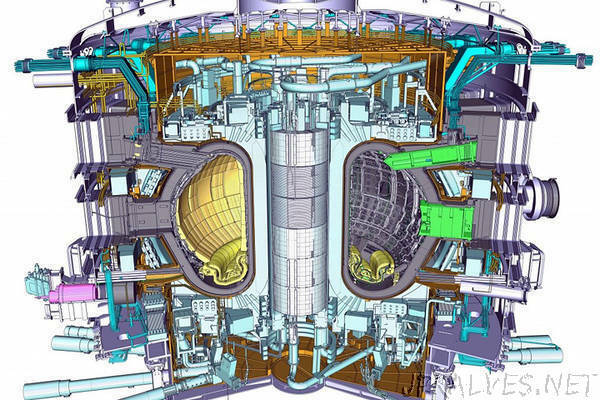 Harnessing this carbon-free energy in reactors requires generating and sustaining a plasma, an ionized gas, at the very high temperatures at which fusion occurs (about six times hotter than the sun’s core) while confining it using magnetic fields. Of the many challenges currently facing fusion reactor demonstrations, one of particular interest to Trelewicz is creating viable materials to build a reactor. A primary candidate for such “plasma-facing material” is tungsten, because of its high melting point—the highest one among metals in pure form—and low sputtering yield (number of atoms ejected by energetic ions from the plasma). However, tungsten’s stability against recrystallization, oxidation resistance, long-term radiation tolerance, and mechanical performance are problematic. In addition to the computational resources they use at their home institution, Trelewicz and his lab group are using the HPC cluster at the CFN—and those at other DOE facilities, such as Titan at Oak Ridge Leadership Computing Facility (a DOE Office of Science User Facility at Oak Ridge National Laboratory)—to conduct large-scale atomistic simulations as part of the project. These simulations inform the structures and chemistries of experimental alloys, which Trelewicz and his students fabricate at Stony Brook University through high-energy milling. To characterize the nanoscale structure and chemical distribution of the engineered alloys, they extensively use the microscopy facilities at the CFN—including scanning electron microscopes, transmission electron microscopes, and scanning transmission electron microscopes. Imaging is conducted at high resolution and often combined with heating within the microscope to examine in real time how the structures evolve with temperature. Experiments are also conducted at other DOE national labs, such as Sandia through collaboration with materials scientist Khalid Hattar of the Ion Beam Laboratory. Here, students in Trelewicz’s research group simultaneously irradiate the engineered alloys with an ion beam and image them with an electron microscope over the course of many days. Through a National Science Foundation CAREER (Faculty Early Career Development Program) award, Trelewicz and his research group are exploring another class of high-strength alloys—amorphous metals, or “metallic glasses,” which are metals that have a disordered atomic structure akin to glass. Compared to everyday metals, metallic glasses are often inherently higher strength but usually very brittle, and it is difficult to make them in large parts such as bulk sheets. Trelewicz’s team is designing interfaces and engineering them into the metallic glasses—initially iron-based and later zirconium-based ones—to enhance the toughness of the materials, and exploring additive manufacturing processes to enable sheet-metal production. They will use the Nanofabrication Facility at the CFN to fabricate thin films of these interface-engineered metallic glasses for in situ analysis using electron microscopy techniques. Beyond his work at CFN, Trelewicz collaborates with his departmental colleagues to characterize materials at the National Synchrotron Light Source II—another DOE Office of Science User Facility at Brookhaven.